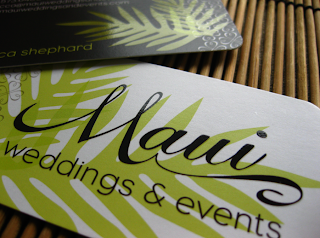 This is a new business card for Maui Weddings and Events that John and I worked on together. He did the Maui logo and the clover and the Laua'e fern. I did the actual business card layout and design. The accompanying website which John is hard at work on is to follow soon. This design has something new that we have not yet done on a card... a special effect on portions of the front and back. It's called a Spot Gloss and allows you to put a gloss coating on some parts of the cards while leaving other parts un-coated. 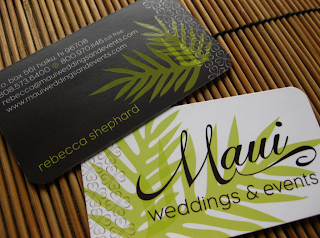 For instance, you are able to apply the gloss coating to a company logo, and leave the rest of the card in a matte finish, as we did on this card. Close-up detail of Spot Gloss. It was applied to the name on the front and only the leaves and clover band on the back. I love it so much I am ready to re-print all of my cards. Very cool and innovative cards. Have you two by chance seen the documentary on "Helvetica" on Independent Lens? It was really riveting and at times very funny. Actually, we have managed to miss the doc when it has been on. We have to keep our eyes and ears open for another showing... or perhaps just check good old youtube. Discussions about fonts can prove to be very funny... or irritating or satisfying, depending upon who you are discussing them with. I love the quote on the PBS site by Massimo Vignelli - "The life of a designer is a life of fight: fight against the ugliness"
Thanks for the reminder. It's now on our "to watch" list.